A $250 security deposit authorization is required with this reservation and we will process a credit card authorization in that amount 7 days prior to your arrival. A charge may result for damage to the condo or contents, missing contents, excessive cleaning required after checkout or for exceeding the maximum number of overnight guests. The maximum occupancy is 2 persons including children of all ages. Violations result in loss of all deposits, immediate eviction and the loss of the ability to make any future bookings at The Napili Bay. The initial reservation deposit is nonrefundable; however if cancellation is made more than 90 days prior to the check-in date, the full initial reservation deposit may be applied to a new set of reservation dates in the same condo beginning anytime up to one year from the original check-in date (subject to availability). Full payment of the rental balance due is required 30 days prior to the check-in date. Check-in time is 3PM and check-out time is 11AM. Please plan your arrival and departures times accordingly. Guests will be charged $50/hour for occupying the condo any time past their scheduled check-out time. An early check-in time or a late check-out time may be available for a fee. Hurricane, Tsunami or Storm Policy: No refund will be given unless a mandatory evacuation order has been given by the National Weather Service for Napili and the surrounding area. In the event a mandatory evacuation order is issued we will refund unused portions of rent of a guest currently occupying the property and any advanced rents or deposits collected for a guest that is scheduled to arrive during the evacuation period. Smoking is strictly prohibited in the condo or on the condo lanai and doing so will result in full loss of security deposit & immediate eviction. There is a designated smoking area adjacent to the BBQ. High-quality, expensive memory foam mattresses (Bergad) are installed in this condo. Waterproof mattress pads are available. Please use these pads if needed. The full replacement cost of a new mattress (more than $1000) will be charged if it a mattress needs to be replaced due to guest negligence. My wife and I went to the Napili Bay and had a great time. The beach was really nice, snorkeling was awesome, grocery stores and restaurants close by. This condo was exactly as the pictures showed and deserves the great reviews. Best beachfront location in Maui with sunset views year round. Watch whales right from your condo during the winter months and fall asleep to the soothing sounds of the ocean. #201 is a special 2 person studio condo on Napili Bay with built-in cabinetry, nice artwork and newly remodeled bath and a kitchen with more counter space than other units we have rented before. The king bed is super comfortable. Two ceiling fans are a plus! This unit is located at the end of the complex with a palm shaded ocean front view. Jim made our stay smooth and easy as did his local representative, Lisa. We thoroughly enjoyed our stay and hope to return. We rented 4 condos from 9/11-9/18, 201, 203 , 207 and 208. We treated our kids and their "significant others" to this vacation. We have stayed at Napili Bay a few times before and it is just the best. The size and the location is just perfect. I new we would have an amazing time but my expectations were surpassed. The kids could not believe the amazing location and for what you are getting you really cannot beat the price. We have talked about one day staying in a hotel on the beach, but we honestly can't imagine anything being any better than Napili Bay!! Everything was great. Sorry about the drinking glass. You can't beat the location.Loved It. Nicely appointed condo adjacent to the beach. Would recommend to family and friends. Exact what I hoped for! This nice little beachfront condo was just perfect for our stay! Everything was very clean, in working order and nicely furnished. Super comfortable bed, amazing view, nice sized kitchen, and lots of extra amenities you wouldn’t expect but totally appreciate, like a small cooler for the beach or road trips. Great communication from the owner, and an overall great deal. I would highly recommend this condo - We hope to come back! We stayed in this condo for a week. The location can’t be any better! Falling asleep listening to the ocean is incredible. The condo is equipped with everything you need. You can’t go wrong!! My only hesitation in providing a review is making this condo more popular!!! What an amazing place! Directly on the beach with everything you could possibly want provided for use!!! My only regret is not staying longer. We hope to come back and stay here in the future it was absolutely everything my husband and I needed for a short get away!!! It was kept up so nice and clean, thank you! We returned to Napili Bay 201 because the beachfront location is so perfect. The second floor lanai has a wonderful view of Molokai and Napili Bay. It's fun to watch the action on the beach below and the sunsets are spectacular. We enjoy being on a quiet part of the island with great beaches and the Kapalua coastal walk. The condo is comfortable and nicely furnished. Started our 9 day stay with 3 days at this beautiful spot and then moved to Kaanapali for a wedding.We loved this unit situated on the corner looking west and north and really enjoyedthe layout.Perfect for two.Ocean breezes door to door.Great time. We came to Maui for our honeymoon and stayed at Napili Bay #201.The condo was very nice and clean with an amazing view of the bay and sunset each night.The lack of AC was not a problem as the louvers on the windows provided a nice breeze day and night. This paired with the ceiling fans kept the temperatures comfortable.We used the BBQ grill nightly as there is a strip mall nearby with a reasonably priced grocery store. We also enjoyed the restaurant/bar at the other end of the bay.Beach chairs and boogey boards were provided and we used these as well.Thanks for a wonderful stay! We hope to return soon. This is the second time we have stayed in Condo 201, and we enjoyed ourselves as much as the first. Four Stars for swimming, snorkeling, turtles, convenient location re snorkel equipment, restaurants, hikes/walks, groceries, massage. The bed is quite comfortable. Once we found the rubber bath mat under the bathroom sink, we felt safer about showering. A grab bar would be a nice addition for us older visitors. The condo manager was pleasant and helpful the few times we contacted her. The kitchen is adequate, although we might recommend a few plastic glasses instead of all slippery glass ones. We are glad the countertops are being updated. We usually ate on the lanai, and the tv trays were adequate inside. It would probably be difficult to fit a table and chairs inside with the corner couches. Thank you for making this lovely spot available to us. My wife and I stayed at the Napili Bay Resort condo #201 July 25-August 2, 2017. That was our second stay at this condo in 2 years. It is an amazing place to stay! From the welcome bag when we arrive, to our last view from the lanai when we leave, this is the perfect place to be! We love being right on the beach for swimming, watching the turtles, and snorkeling! Watching the sunsets from the lanai are amazing! The condo is equipped with everything we needed for our stay, including the beach chairs and the boogie boards. It is indeed a quiet place to relax and unwind! We love staying in #201, and will definitely come back again! Mahalo Jim for sharing your little piece of paradise with us! The location can't be beat! Best unit location right on Napili Bay beach. Kapalua Bay beach is close. Water activities are safe even way out. Great restaurants close by. The unit is small, but functional and comfortable. I suggest a grab bar in the shower. It is narrow and a bit slippery even with the mat. Many of us have balance problems and anybody can slip. Not expensive and easy to install. We would not hesitate to go back again. Location, Location, Location ! ! !We have visited Maui before, but have always stayed in the high rises in Kaanapali. This time we decided to go the condo way. To our surprise this was the best decision we've ever made. The condo was clean and what a great view from the lanai. The beach is beautiful. No more high rises for us. The bed super comfortable. We really appreciate all the details you provided. From the easy check in, all the directions, beach chairs etc., to the TV trays. Jim, thank you for letting us share your paradise. Thank you for the welcome bag of goodies. Can't wait for a return trip. We came home with great pictures and memories. We had a great time. We recommend this location. We had the best time in unit 201 of Napili Bay. We stayed there for 9 days on our honeymoon. The unit was spotless when we checked in. It's a small studio condo but we had plenty of room since we were out and about exploring or on the beach snorkeling every day. We loved having a table and chairs on the lanai as we spent so much time out there. The kitchen was very well stocked and had everything you could need. The unit also came with 2 boogie boards, 2 chairs, and a cooler. We saw a lot of Maui during our 9 day stay and hands down, Napili Bay was our favorite area. The snorkeling out front was amazing. We saw man sea turtles and so many different fish. It was wonderful to just walk outside and be able to snorkel without having to drive anywhere. Additionally, Napili Bay is walking distance from Kapalua Bay which also had amazing snorkeling. Napili Bay is pretty far north on West Maui so it requires more driving to get places like the Road to Hana and Haleakala, but we felt the extra driving was more than worth it given how amazing the Napili Bay area was. We really hope to come back again for a future anniversary as this was our best vacation as a couple ever! First of all, I cannot give your Condo a good review. The place was not clean, including greasy finger prints on cabinet doors, floors, bathtub, sinks, end tables and furniture. You need to completely update the Condo. The couch was so broken down that I had to put 2 pillows under me to sit at a normal height. There was no table and chairs to sit at and eat except on the balcony. The bed was comfortable. Shower head was partially clogged, the kitchen faucet was hard to move from side to side, and the garbage disposer sounds like it is about to break. We paid $50.00 more per night than other couples, and their Condos were a lot nicer than yours. We will never go back to your Condo again. The view was nice from the balcony. Thank you for your review and frank feedback. My local contact and cleaner couldn't confirm the greasy fingerprints but nevertheIess I had a deep clean peformed just to make sure and they do the interim cleans as scheduled. The sofa has been replaced with a brand new sectional. We have TV trays in the closet for inside dining but most guests dine beachfront on the balcony. The kitchen countertops are being replaced with granite countertops in September and the sink and faucet are being replaced as well. As mentioned during our phone conversation after your stay, I've refunded the difference in the price paid per night that you mentioned in your review. To prepare for the remodel in September, I checked the condo last week and it's looking really good, clean and organized. It will be even better after the remodel and thank you again for bringing these issues to my attention. My husband & I have stayed at Napili Bay Resort #201 for 11yrs. We always enjoy our stay. The condo has been redecorated & refurnished several times during the years we've been coming. The owner Jim Dornfeld has been very accommodating. He always finds a way to meet our needs. We highly recommend staying there. Stayed here for the 6th time which is a clear indication of how much we like the location and the specific unit. The unit has everything we expect to have in a Condo rental located right on the beach including towels, chairs and boards. The view from this beachfront unit spectacular. Such a beautiful view! Great welcome goodies! We had a wonderful time! We even got to watch a couple getting married right on the beach! Great beach chairs and boogie boards. The only thing that was wrong was that there was no shampoo or conditioner in the unit. I checked the website before our trip and it said shampoo was provided. I probably should have called to ask for some, but I didn't as I had a little bit with me just in case. We've been to Napili Bay four times - twice in unit 201 of the Napili Bay Resort (our favorite). It is the perfect location to watch the waves (and people watch too). Life doesn't get much better than this! I must say, for the first time, I am very disappointed. After traveling all day, as most of us do, I walked in, to find filth. I was going to set my bags down, then sit on the sofa to chill for a few. However, the once beige sofa, was filthy black. It looked like someone had been doing auto repairs on that thing, for years. No kidding. Well, that was my very first impression, which then led to other negative thoughts. After seeing the sofa in that condition, there was no way I was going to lay in that bed. It was comfortable, but I just layed a towel on the bedspread, and slept on top for 6 nights. There was no way I was going to use the drawers, or anything else that had to touch my belongings. I have to mention the grout on the kitchen counter is pretty dirty, so food prep wasn't going to happen there, and the oven has rust on the bottom. The floor tile grout is black, especially in the bathroom area, probably from sand, from people who don't remove their shoes.Maid service- wise, it was clean. Maintenance- wise, needs work. One can probably imagine how I felt, having paid $169 per night for this. I think it is shameful to rent this unit, in this condition, but then to charge a $120 cleaning fee is just obscene.I believe if I ever return this beautiful little complex, I will only rent from Chuck Buser. I have never been disappointed with his units.I have stayed at this complex five times over the past several years. I have given great reviews on Tripadvisor, and have recommended this place to family and friends. It has well maintainded grounds, on a beautiful beach, for a reasonable price, depending on the season. I have never been disappointed, until now. If this had been my first stay, I would have never returned.I believe it is only fair to other travelers, to give the same honest review on the Tripadvisor website. I would be remiss to not let others know what to expect, and to help them make decisions about where to spend their hard earned money. I appreciate that you've provided feedback on your stay at my beachfront condo last month. I am sorry to hear that you were "very disappointed" with my condo. - Truly awesome accomodation - on the beach! It is difficutl for me to read your review and to not have had the opportuntiy to remedy your problems. This is the first that my local contact and my cleaning person heard of your complaints as well and they are local and very quick to respond to any issues that my condos bring up. We are available to reapond to any issue that you might have and our phone numbers and email addresses are in your check-in information as well as poasted inside of the condo. We woud have addressed/remedied each of your complaints in detail (if possible) with you immediately after you found and reported them to one of us. Since we didn't have that opportunity to respond that way, I'll go ahead and give it a try now by responding to each of the items that you brought up. 1. Sofa - the sofa is a sage green sofa, not beige, and it was professionally cleaned June 1, 2016. As far as we know, there have not been any auto mechanics staying in the condo since that time. 2. Bed - the bed in my condo has a solid teak wood frame, no box springs but a solid wood box that is better for the high-end memory foam mattress that has protective covers to keep out pests. I get lots of compliments about the comfort of the mattress and I am glad that you found it comfortable. I've slept on the same model of mattress for years and put them in all of my properties. I've just replaced the bedspread too. It would have been nice if you could have been specific with what you didn't like about "that bed". 3. Drawers - the condo has custom solid-wood maple cabinets and teak dressers and drawers. They were all custom installed in 2003 and have held up extremely well given the beachfront conditions. You didn't mention why your didn't want your belongings to touch them, but I am curious to know as I've never heard a comment like this before. My local contact reported that they are clean and tidy. 4. Grout - the kitchen has tile countertops with 1/8 inch or smaller grout lines. They were installed in 2003. I've learned my lesson about grout in Hawaii and have found that it is impossible to keep grout lines on kitchen counters spotless. I am now installing only stone or stone-based countertops in my properties and will be changing out the counters in 201 and 217 in the next year. I am sorry that you had to deal with less than perfection as I have a problem with that as well. 5. Oven - we've found that rust begins to grow in a new oven within 6 months of installation in a beachfront or oceanfront condo in Hawaii. We cover the bottoms of the ovens with foil and replace stoves that are unsightly or not working. This is the first complaint that I've received about the oven and I am going to look into it further and replace it if needed. 6. Floor Tile - the grout in the floor tile has the same problem as I mentioned in #4. I am going to try a cleaning service and then reseal the grout to see if that makes a difference. I am again sorry about less than perfection with dirty grout lines and will try to get them cleaned. 7. Maid Service - I am happy to hear that you thought that the condo was clean but it seems like a contradiction to your earlier statements. Nevertheless, I am really happy with my cleaner and she does and excellent job based on the feedback from many others. Overall, your review has me feeling more motivated to update the countertops and bathrooms. I just did that in both of my condos at the Hanalei Bay Resort in Kauai over the past year, so I need a little bit of time and money to do my 2 condos in Maui. Thank you again for your feedback and I am sorry that you were disappointed. I wish you the best and please contact me directly if you'd like to provide any additional feedback or details. My young son and I stayed in condo #201 for 6 nights. The studio was perfect! Firstly, and most important to me, the condo was thoroughly clean; everything from the kitchen, the kitchen equipment, the fridge, living area, bathroom, lanai and fresh sheets. We have dietary restrictions so we needed to prepare all our own food (grocery stores nearby) and the kitchen had everything we needed. Even a rice cooker! Plus I love to cook. All the kitchenware and equipment was in great working order; same goes for everything in the condo actually. The condo was so comfortable. It was home away from home. The location is magnificent!! When we arrived, the first thing my curious son did was go straight to the balcony. When he opened the door, his face was all excited and he pointed and exclaimed, "Mommy! The beach is RIGHT THERE!!". He couldn't believe it. There were even boogie boards at the condo which proved invaluable! My son used them everyday right on Napili Bay Beach. This beach is superb. Parking is within the complex-super easy and convenient. Nice quality BBQs!!! The bed. It is so comfortable! We got the best sleep those 6 nights. And no mosquitos, yay!I can't really imagine a better vacation that this. We came back home restored and with wonderful memories. Thank you Jim for making the entire process of staying here so smooth and so pleasant. I really appreciated all the attention to details- like the easy self check-in, driving directions from the airport, the cleanliness of the condo, the ice cooler, TV trays, waterproof mattress cover, Wifi, nice cookware, super comfy bed, beach chairs, handy kitchen supplies, helpful general condo guidelines, and the special gift bag and treats.We would love to return and stay in condo 201 again in the future. Truly awesome accomodation - on the beach! We felt privileged to stay at Condo 201 Napili Bay in June 2016. Its a very special location right on the beach. We particularly loved that we could sit on the deck and watch all the action with the waves, yet have the benefit of some shade. The condo itself is well well appointed with all mod con's including a very very comfortable bed. We hope to be back and will definitely be wanting to book # 201 due to the views, sunset and late afternoon sun and end unit location. The unit has everything that we need. And thank you so much for the big bag of goodies!! !The ocean been a bit rough during our stays there. But it also means some good waves for people who enjoy the surfing.It is a good value for a place with everything and have direct beach access. We make use of the laundry machines ....will be appreciate if the unit also can provide the laundry detergent in future, since guests will not be using much of them.Thank you for sharing this super place with us, Aloha and Mahalo! We really enjoyed our stay! Everything was perfect. The kitchen was supplied with everything we needed. We enjoyed our long walks to Fleming Beach. We would definitely like to stay in this Condo #201 when we return to Maui. Thank you for everything! Fantastic time at Napili Bay! We spent the most fantastic week at Napili Bay Resort - this is paradise! Our condo was literally on the beach - it was very soothing falling asleep to the sound of the waves right outside the balcony!The condo itself was awesome - Jim thought of everything - all the essentials are there - including salt and other spices, a small cooler box, beach chairs and more! There is no need to go out for dinner - the BBQ area has top of the range Weber gas BBQ's and tables and chairs - which makes for a relaxing atmosphere in the evening with the waves in the background!We were welcomed by a beautiful basket filled with Hawaiian treats - very thoughtful! Thanks Jim - we will definitely be back! A perfect condo on a perfect beach. The condo is a studio, but nicely arranged to feel spacious. Very thoughtfully furnished - homey, and all you need is there. We spend most of our time on the lanai - what a great view of the action on Napili Bay and sunset and island views. Thank you for the nice gift basket. Highly recommended! We loved Condo 201 for the our recent stay in Maui and will ask for the same one when we return to Hawaii. We stayed in #201 August 21-27, 2015 to celebrate our 41st anniversary. The condo was amazing! The welcome basket we found when we entered the condo for the first time was a wonderful surprise! It was full of lots of goodies that were much appreciated! The condo was clean and stocked with everything we could have needed. The beach towels, boogie boards, and beach chairs were great for our days spent on the beach! The king sized bed was so comfy! The views from the lanai were spectacular, and the sound of the waves lapping the beach all night lulled us to sleep. We loved that the condo was right on the beach! It was amazing, and we definitely plan to return and stay in # 201 again! Thank you Jim for your hospitality! As always this little hideaway is the best . Being nestled above a picture postcard beach with outstanding views , it doesn't get much better. We had a wonderful, relaxing stay at Napili Bay 201. This was the best equipped condo we have ever rented. It was impeccably clean upon arrival and the gift basket and welcome sign was such a delightful surprise. I am a very fitful sleeper and I had the best sleep in years on the comfortable bed lulled by the crashing surf. The condo is as advertised 30 seconds from door to beach. We have already booked a return stay. Thank you Jim for sharing this piece of heaven with us. In our 16+ visits to the islands, this was the closest we have ever been to the ocean. The condo was perfect for two people. The patio had a table where we enjoyed our breakfast watching the sunrise. In the evening we watched the sunset over the ocean. The kitchen had everything necessary for cooking. The outdoor grills are in excellent condition. The condo had plenty of space to relax. It is conveniently located near two restaurants and the costal walking trail that runs over a mile and 3/4s. There is absolutely nothing that could improve this unit. My wife and I stayed in Condo 201 Sep 2014 for 26 nights and enjoyed it very much. Napili Bay is our favorite beach on Maui and with this oceanfront property your only 40 yards or so from the water. Condo has no air-conditioning but there are two ceiling fans along with cool ocean air that make it unnecessary. Already several reviews about the wonderful king-size bed and they are all true along with having a very nice sectional. Kitchen has everything you need along with a Fridge/freezer with ice maker that keeps everything very cold. Napili Bay property has two barbecues located steps away behind Condo along with washers and dryers and a very nice ice machine. If you stay in Condo 201 you have the Seahouse Restaurant located on the beach, Gazebo Restaurant 5 min walk, best beach on Maui, hiking trail along the coast just past Seahouse and best of all a great condo! You will not be disappointed if you stay here. Cozy stay overlooking a picturesque beach. We could not have asked for a better location to spend the weekend. The condo was well appointed and had all the amenities one could ask for. Napili Bay is an outstanding resort location with wonderful crystal clear waters and a picture postcard view . It doesn't get much better than this. This is our new favorite getaway spot on Maui, and we've been to most all of them. Napili Bay Resort #201 was just the perfect condo for our tropical vacation.The condo had all the extras that you could possibly need or want. It was cleanand very nice inside with lots of upgrades. The mattress was heavenly!! !We would definitely come back here! This condo is wonderful. It's in a great location in the complex. It's stocked with everything you need for a comfortable stay. Lots of storage and cabinets. Newer ceiling fans that keep the air flowing. Nice corner sectional sofa. Really comfortable large king bed. This is our favorite place to stay in Napili. Condo 201. It doesn't get better than this. We stayed in condo 201 for a week in april 2014, and we absolutely loved it. The view is simply stunning. It's right on the beach with a front row seat to the picture perfect sunsets every night. Since it's a top floor corner unit, you only have one shared wall with the other guests (not that we heard them anyway). The condo itself was spotless and furnished with everything you need to really feel at home instead of merely renting a room. Having a full kitchen with all the appliances and dishware you need makes it easy to save money by not being forced to eat out for every meal. The bed was huge and extremely comfortable. The sitting area has a plush corner couch that I assume was nice, but it was impossible to choose sitting indoors on a couch over the view from the balcony. All in all, we couldn't have asked for anything more. The off-season price was a steal especially given the view, location and amenities. The minor complaints of a small tv, squeaky bathroom door and inconsistent shower temperatures are well overshadowed by all the positives. I highly recommend this place for anyone traveling to Maui! Wonderful time from start to finish! We had a fabulous week in Napili and highly recommend condo 201. The space was perfect for a vacation rental - it was clean, the full kitchen was a huge plus, the bed was incredibly comfortable and you can't beat the location. The whole experience was great - when we arrived we found a gift basket waiting for us which was a lovely welcome. On our last day the housekeeper called to see if we had any questions to make our checkout easier - amazing customer service! We were really sad to leave and I have already passed along the information to a couple of people at work, telling them to book this space. Looking forward to returning next year - thank you to Jim for making our stay so wonderful! If you prefer resorts with tons of amenities that are stretched out over acres and acres of property this is not the location for you, but if you prefer small units with an outstanding location and view right on the beach this the place for you. While the beach is the main attraction there are great restaurants within walking distance or a short drive. The unit was fully equipped, very clean and comfortable. We were finally able to relax and unit 201 was the perfect location: perfect part of Mauai, perfect part of Napili Bay Resort and perfectly clean. This is an end unit closest to the beach access gate and the outdoor shower and the BBQ area. We spent much of our time on the lanai, protected from the sun and close to our cold drinks in the fridge. To take a dip in the water we simply walked out the door, down the stairs, onto the sand and into the water. Coming back we would rinse off the sand and salt and get back to our private, comfortable and shaded lanai. It was such a treat to spend 4 days at the beach and not get burned by the sun. When it came time to BBQ the food was still piping hot when we sat down to eat because the BBQ area was just a walk down the stairs and a short sidewalk. The bed is fabulously comfortable and the wifi is fast. The layout in the condo is very efficient and comfortable. Booking online couldn't be simpler. We can't recommend this highly enough. We had a great 5 days in condo 201. Napili Bay is lovely, the condo had everything we needed and we loved snorkelling with the turtles in the bay just south of Napili Bay. The Gazebo was good fun and the food was good and the Coffee Store just down the road has great coffee. Awesome part of the island to stay. Jim. forgive me for not writing sooner. The stay is what we both needed. It was so nice to relax at your condo. Napili beach is our favorite. We met new friends, used the BBQ, enjoyed it all. We enjoyed the top floor corner unit 201. I found it clean and orderly, being a owner of a cleaning company that is always a biggie for me. Our view was wonderful for people watching, whale watching and sunsets. We were blender to beach in 30 seconds, condo to breakfast, lunch or cocktails walking in 5 minutes to not only one resturant but 2, a very nice grocery store was within 7 minutes in the car, and shopping in 30 minutes. We felt special when we located a welcome basket upon our arrival. We enjoyed the BBQ area with table and chairs near by. This is a place we would concider returning to. My husband enjoyed the week with snorkel and fins, I saw him several times by the color yellow... he enjoyed himself also. We loved being so close to the water, even though the waves did get very loud on occasion. We spent a lot of time on the lanai watching the waves and people. The condo was very nice and clean, with a very comfy bed - we might have to go out and buy one just like it! We had a problem with the phone, and it was fixed right away. Our only complaint was the water pressure in the shower - it sometimes went hot or cold on us. We would stay there again. We had a wonderful time staying in Napili Bay Resort #201. The bed and couches are very comfortable. Having the memory form quality mattress made for a very nice night's sleep listening the the ocean. The lanai had beautiful views of the Molokai and Napili Bay. The high table and chairs on the lanai were the perfect place to enjoy the view with your morning coffee and breakfast. The kitchen is fully equipped with all the appliances you would ever need. The Weber grills in the common area are very convenient to this condo location. We are local residents of Maui and this is now our favorite staycation location. The view from this unit is beautiful; easy access to the beach, bbq area, parking. Loved hearing the waves at night. Having the jalousie windows allows for a great cross breeze along with the overhead fan and we never felt uncomfortable without a/c. We enjoyed meals on the lanai--couldn't get enough of the view and beach. Beach is great for families and snorkeling, too. The owners provided boogie boards, beach chairs/towels; a binder with info about the area, menus from restaurants and recommendations; and were very welcoming to us. The condo is not spacious, but it provides everything and we weren't in the condo much because when we were there, we were on the lanai. We would absolutely rent this condo again! We stayed at Napili Bay 201 for the second half of our honeymoon after staying on Kauai at the Koa Kea boutique resort. The intention was to "splurge" on Koa Kea and then balance it out with a cheaper condo rental. Don't get me wrong, Koa Kea was amazing, but we honestly enjoyed our time at Nb201 just as much (albeit for different reasons). When picking our "affordable" condo rental, something that was right on a good beach was a must, as well as an updated interior with newer furniture, kitchen & bathroom not like sooo many other condos in the area that seem to be straight from 1972. We were completely satisfied with how it looked inside and we were very comfortable. Everything including the lighting has been updated which can be dimmed to set the mood. I'm not saying everything was brand new and top-of-the-line but it was definitely to the level of a typical modern middle class home or better. The beach was perfect; not too busy, lots of fish, some turtles and even a few eels to see while snorkling, and a fantastic view of the sunset as it sets over the island of Mokolai every night that we enjoyed from the balcony. There is a nice restaurant right on the beach, and I was able to walk 15mins to a very nice golf course one morning (Kapalua Bay). Overall, nothing bad to say about this place. Don't hesitate to book it! The star rating does not do justice to this unit. A 3-star equals "average” and a 4-star equals "very good”. It was neither, it was just good. It does not rate "very good” because of the fact that the unit was very cramped with furniture, the shower/bath was dated, the bed spread a bit "whew" and dark. On the other hand it had everything you could think of in terms of gadgets such as Wi-Fi, i-pod docking station, flat screen TV (we only used once)books,games,video's and Dvd's. Most importantly it had beach chairs, but unfortunately no beach umbrella. The towels were adequate, the utensils and dishes were more than that. However the location was spectacular. We felt we got our money's worth, but I would not pay more than "special low season prices. Mahalo for your review and comments on my beachfront condo. It is a studio condo and difficult to put a large and luxurious California King Bed along with a Plush and Comfortable L-Shaped Sofa for 2 in a smaller space. You may want to rent a 1 bedroom for your next stay and we have some great ones at the Kaleialoha and Nohonani resorts.. I am glad that you liked the Free Wi-Fi and HD TV that is kept hidden behind the Custom Maple Cabinetry that was specifically designed to fit the condo. I am also pleased that you liked the fully stocked custom kitchen that again was designed for a small space. I no longer stock beach umbrellas because they can blow out to sea due to the constant and cool trade winds that blow through Napili. Please do take advantage of the great big tree right in front of the resort where our local resident manager Lee has trimmed to look and work like a big umbrella. It's the best shady spot on Napili Bay Beach. A new bedspread has arrived and I'll have both my local contact and my cleaning company continuing to keep a close watch and make sure everything is in order. I don't know what you mean by "whew" but it would have been nice if you had contacted either my local contact or my cleaning company to rectify any and all issues that you had. They are available and glad to help anytime via the phone numbers provided in the condo and in your check-in details. Perfect Location ~ Perfect Condo! Our stay couldn't have been better! We chose Condo 201 because of its corner location facing the bay and its lovely furnishings ~ and everything was perfect. (Thanks so much for the gift basket!) Napili Bay is a little piece of heaven with its turquoise waters, amazing "honu" and tidal pools. The condo was spotless, well appointed and had everything we needed. Our plan was to snorkle, swim, walk and eat lots of good food. Napili Bay is a great location ~ it was a quick drive to great restaurants in Lahaina, Kapalua and Kaanapali, and we really enjoyed the peace and quiet of this low-rise community and the Gazebo and Sea House restaurants at either end of the bay. Can't wait for our next visit to Condo 201 and Napili Bay! Feet away from the water! Condo 201, in our minds, has the best location in the resort: corner room and upstairs, and literally just a few feet away from the sand. It was stocked with everything imaginable, and the gift basket from the owner included coffee, macadamia nut chocolates and cookies, and more. Ideal location for those who want to get away from the crowds at Waikiki, plus great snorkeling and restaurants within walking distance. We will return soon! From the pre-arrival organization, including directions from the airport, to arriving at the clean, comfortably furnished, ocean-front condo, complete with open air breezes and the sweet welcome gift, staying at this condo was paradise. The location couldn't be better! The view from the balcony is phenomenal ... the beach was perfect ... the quick beach walk to the Gazebo for breakfast or the Sea House for happy hour a huge bonus! Will return in the future! beautiful,self-contained unit on the beach. The unit is equipped with all the basic needs including beach chairs and boogie boards. A basic kitchen with dishwasher and coffee maker makes for easy beach front living. Beautiful grounds and a short walk to a wonderful restaurant on the beach. A great lanai with table and chairs for relaxing.Comfortably furnished with a wonderful bed.A short walk to a local convenience store. Would definitely return...loved the beach; great snorkeling and turtle watching! We stayed at this condo for a week in November 2011 and it was excellent. Location to the beach is seconds away and the condo is weell appointed and met all our needs. I loved my stay in Unit 201; well equipped and clean; loved listening to the waves and snorkeling off the beautiful beach. I hope to return and do it all over again! If you are looking for the perfect get-away in Maui, look no further. Condo 201 is a corner unit with a great view, updated furniture, wireless internet, and everything else you need (boogie boards, beach chairs, full kitchen, etc) for an amazing vacation in paradise. The owner provides great communications throughout. This was our 4th trip to Maui. We've stayed at another condo on the same beach, but it wasn't available. We preferred it. This unit is partially very good, partially not so good. Right on the beach, and yeah, the waves are incredibly loud! Beach activity starts by 7 a.m. The condo BBQ area got noisy on some nights. The lanai now has a view straight through the next condo building to the north because of landscape work done while we were staying there, but there's no privacy on the lanai anyway because of the beach. Excellent linens & mattress, kitchen equipment very mixed. I did some extra cleaning. The furnishings were too dark for me, and I would have liked a dining table rather than just a coffee table. Thank you for your review and I am disappointed that my beachfront condo didn't meet your needs. Please keep in mind that the landscaping work only temporarily opens up the view to the condo complex (Napili Sunset) located north and behind the Napili Bay Resort. The banana trees grow back very quickly - in weeks! Because my condo is a corner top floor condo, it has a view to the north as well as to the west. See the 5th view photo on the Aloha Condos website (http://www.alohacondos.com/assets/photos/unit227/medium/1view5.jpg) to see this view looking directly north (the condo lanai faces west) and you'll see the landscaping and the resort behind. We have staff available 24x7 every day of the year if you have any problems with missing kitchen equipment or cleaning. I encourage all of my guests to make use of these services, and I provide a phone number in the check-in materials as well as inside of the condo. Again, thank you for your review. Absolutely wonderful condo, right on the beach ... a fabulous view of the bay. We spent many an evening on the lanai having dinner and drinks thereafter. The condo also had one of the most comfortable beds I have ever slept on; something I appreciated as I have a bad back ... I slept like a baby. If you are a light sleeper you may wish to bring/purchase ear plugs. Additinally they have everything you need there (they supply everything from beach towels, boogie boards and beach chairs) ... the snorkeling in the area was a highlight; there is a Snorkel Bob's around the corner if you don't own any gear for dollars a day. Awesome place to stay. Would return any chance I have in the future.Very relaxing! Pros: Best condo on beautiful Napili cove--nice understated tropical decor with wooden louvered shutters to let in the trade winds. Owners provided a deluxe basket of fruit and chocolate when we arrived. Very well-equipped kitchen with everything provided to bbq on the gas grill and dine on the lanai with a spectacular view of Molakai. Condo is economical on space, yet there was plenty of storage, a king bed with luxury linens, and an L-shaped sofa big enough for both of us to stretch out with our books in the evening, Perfect for anyone who wants to be steps away from the beach--you'll hear the surf in your dreams which we loved. I went swimming twice a day and it was so convenient to practically step out of the ocean and into the condo. Cons: None unless you are super noise sensitive. Walls are thick, but you will hear your neighbors on the lanai and the surf at night. Suggestions: Can't think of anything to make this condo better. Maybe a tea pot to go with the tea kettle? Really, evrerything was lovely. Wonderful treasure of a place. Incredible view and access to beach. Close enough to Lahaina. Check out the coastal trail that starts just about a half mile north. No complaints at all. We stayed in unit 201 for 11 days in late April-early May and simply cannot say enough great things about it. The view is spectacular from the private lanai - a view across to Molokai, perfect sunsets, etc. The beach is right there below, just walk out the door, down the stairs and there you are. The beach where the condo is located is great for swimming and sunning and relaxing. If you like snorkeling better, the cove to the left (across the rocks) and the first beach to the right (go through the resort on the point to the right) are both fantastic. As for the condo itself, it is nicely decorated, the bed is large and comfortable, and the kitchen has everything you need to prepare meals. There is a decent grocery store in Napili Plaza 5 minutes drive away. My girlfriend and I had the time of our lives - this place is simply magic. The price is very affordable too, not cheap but much less than a Lahaina/Kaanapali hotel/resort and the experience of being in your own condo is MUCH better than what you'd experience in a hotel. I have been to Maui several times, and this was by far the most enjoyable place I have ever stayed. One reviewer said that the waves were loud at night, which is true but you kindof tune it out pretty quickly. Maybe because of all the fun we were having, we had no problem sleeping and found the sounds of the waves very relaxing in no time at all. Anyway, trust me, this place is fantastic. 25 or so years ago, I lived in Maui and had to drop off a car in Napili to what I think was this unit. I remember standing on the lanai thinking that this was the best location in all of Maui. When I decided to return to Maui this spring, I used Google Earth and the web to track down this unit and the owner. I am very glad that I did. The unit is well equipped with everything that one needs for an extended stay- complete full-sized kitchen (refrigerator, stove, dishwasher) and kitchenware (even a rice cooker), boogie boards, beach towels, very comfy beach chairs, sofa, king bed, and a pile of movies. The unit is simple but has everything and it all is in excellent condition. In my opinion, this second- floor corner unit is the best location on Napili Bay. You can sit on the lanai and watch the people on the beach and have dinner while watching the sunset between Molokai and Lanai. I used to own a rental in Hawaii and know the commitment that it takes to keep a unit up to date and this owner has done an excellent job. I found Aloha Condos to be very professional and attentive with a good website with lots of info. This condo is literally on the beach, one could not get this project approved in this location today. I love Napili Bay. There is surf, snorkeling, and good beachfront restaurants on each end of the beach. The area buildings are a reasonable scale and the entire vibe of the area is old-school Maui. The nearby Napili Kai Resort has a Wednesday concert series with the best slack key guitarists in Hawaii. In terms of cautions, the sound of the surf is wonderful and relaxing to me. If you are not comfortable with the noise, this may not be the unit for you. Once again, this unit is literally on the beach. Beach goers make noise and that starts about 8 am. The unit is a studio so there is no bedroom to use as a getaway. Not friendly for disabled visitors. I will definitely return and recommend this unit to friends. How lovely to arrive wiht a most beautiful welcome basket of goodies. Upon opening the door; to first hear the crash of the ocean and then see the true and spectacular beauty of Napili Bay; the ocean, the beach and the sunset....truly spectacular!The accommodations were just perfect on such a lovely bay and oceanfront! Quiet and lovely just perfect for our needs! Napili is a wonderful little oasis in the western resorts of Maui. Napili Bay Resort, #201 was a great location -- right on one of the best little beaches in the area. You can hear the waves all day and night long. The studio was small, but immaculately clean and had everything we needed. The king-size bed was great -- very comfortable. We did a lot of cooking using the BBQ in the common area -- it was a great way to meet people and they were very nice. Our experience was better than we imagined it to be. We stayed in Unit 201 for 12 days. It met our expectations and then some. The onsite manager kept the grounds very clean. Jim the owner was helpful and answered all the questions we had prior to our arrival and afterards. I still hear the swooshing of the waves of the clear blue water. Unit 201 had the best ocean front view. It also had the most privacy of all units. Most of our time was spent on the lanai watching the beautiful sunsets. The condo was equipped with everything you could think. There was even a small cooler to use for day trips. The mattress was very comfortable. Location couldn't have been better, we discovered a coastal hiking trail within walking distance of the condo. Although there was no air conditioning, we found it to be comfortable with the fans and the ocean breezes. Would highly recommend it to all our family and friends. We looked forward to this trip and were excited to find a reasonably priced condo right on the beach. Communication between the condo owner and us was really good and we had no trouble finding or getting into the condo late at night when we arrived. The home was just what we expected having seen photos on the internet. The kitchen was fully equipped and we were especially surprised and pleased to find an ipod dock in the room to charge our ipod and itouch. Some of the issues we had were that the unit was very tidy and 'surface' clean...it really could have used a thorough cleaning as it was somewhat grubby. The king sized bed needs a new mattress as it is very sloped on the side closest to the bathroom and this was hard on my back and made sleeping difficult. So, it wasn't restful sleeping there.The location and Napili Beach is wonderful. There were a couple of times that I would have appreciated someone in the 'office' to get some service...but, there's no office or obvious way to reach a manager for the complex. This was a bit frustrating.The bed alone would prevent me from renting this condo again. We thought we would 'love' the sound of the surf lulling us to sleep, however, the surf was bigger than usual (the locals said) and very loud....crashing and roaring all night which also interrupted and affected our sleep. Otherwise, it was a nice stay. Thank you. Mahalo for your review on my beachfront condo in Maui. This is the first negative review I've received so I felt it was important that I personally review your concerns. Your review notes that the condo needed a thorough cleaning so I've made my local contact and cleaning company aware of your disappointment - but first thought I'd check out the condo myself before letting them know. When I first arrived in Maui there were guests already in my condo, so I asked them if felt the same way as you and they said absolutely not. They were surprised that a previous guest party had not felt the condo was thoroughly cleaned. After the guests left I did an inspection and again didn't find the condo to be dirty "behind the surface". Of course my cleaners are now on alert and my local contact will continue to check their work after every cleaning. Your comment on the bed mattress surprised me and I am sorry that you had trouble sleeping. I have installed 10 of these same high quality mattresses in all of my vacation rentals in Hawaii and have never had a negative comment since I put them in 2 years ago. The brand is Bergad and they are high-end Isoform Visoelastic mattresses. I've found them to be better than the Tempur-Pedic mattresses that I used to use because not only are they more comfortable, they are much cooler. I've had at least 20 comments from my guests raving about how they had never slept on a better surface and I love sleeping on them myself. Based on your comment about sloping, I just replaced the box springs. The old ones were built for a spring-type mattress and the new ones are specifically made for Bergad-type mattresses. You had mentioned that you needed to reach somebody for service but you never tried to reach my local contact or cleaner during your stay. Their phone numbers are included in the check-in materials as well as inside of the condo and they are available 24 hours a day. It would have been nice to have been able to give them the opportunity to resolve the issue(s) that frustrated you during your stay. Lastly, this beachfront condo is 35 feet from the ocean. You would land in sand if you jumped off the lanai. The sound, smell, sights and feeling of being by the beautiful blue waters of the Pacific Ocean is why this condo is so popular. If you don't want to have this direct beachfront experience, I own condo 217 and would recommend this lovely beach view condo as a better choice for any future stay with us. We loved the view, the close proximity to the beach, literally the condo is on the sand, on the beach! For our first trip to Maui, a condo is perfect with all the amenities, to cook breakfast and/or lunch, order in pizza...it was great. I forgot to pack a beach bag, but in the gift basket we received, there was one~plus delicious fresh fruit and goodies!! We walked up to the restaurant on the beach and had the best "award winning poke nachos"!!! Snorkeling with turtles everyday, wasn't so bad!!! We didn't need anymore room that what we had, you spend so much time at the beach or out adventuring anyway, it was perfect. The only thing I would complain about is that we could have stayed 2 weeks, one wasn't enough to enjoy the island. Next time I will stay longer!! Unit 201 at Napili Bay is a dream. You couldn't be closer to the water and the views are amazing. You can see the islands of Lanai and Molokai from the condo, not to mention the lovely stretch of soft sand and blue water right in front of you. The mattress was the best I've ever slept on, one of those visco-elastic memory foam beds. It's also a king size bed, which for some reason is hard to find in a studio condo out there. We swam with turtles every day. The best way to do that from the condo, by the way, is to walk left at the beach and follow the little footpath over the lava rocks to the small, protected bay on the other side (you'll pass the Gazebo restaurant). There are a couple easy entry spots, you'll see people getting in and out of the water, just follow them. The only "con" I can think of about this place is the constant sound of waves hitting the shore, 24/7, day and night. That's really nothing to complain about, I know, but I'm a light sleeper and we had to keep the windows open (it was August), and the waves really can seem noisy in the middle of the night. But that said, I would stay there again in a heartbeat. Can't wait to go back. P.S. For anyone who cares, I did not see a single bug in the condo. This end unit (north) provides a more panoramic view of the beach from the lanai. And 2nd floor adds more privacy as neighbor condos cannot see down into your space. Nice beach for kids. Waves were large enough to have fun without looking dangerous. The beach chairs provided came in handy. Shaded outdoor cooking area was a nice addition to the full kitchen inside (with blender, toaster, etc). Onsite manager (Lee) and cleaning staff were pleasant and kept things neat. excellent place! first time vacation home renter, and we were not disappointed. the condo was exactly as described by the owner and there were no surprises, other than the gift basket which we enjoyed to the fullest! we would definitely recommend this property to everyone, its right on the beach, exactly 12 steps down the stairs to the sand. condo had everything, beach chairs, beach towels, and an unbeatable view of the pacific ocean. you cant beat being woken up in the morning by waves crashing onto the beach. perfectly awesome vacation! This was our first trip to Maui and must say that it lived up to our expectations due in large part to the Napili Bay Resort. Everything was clean and ready for us when we got there and the location to the beach was awesome. We can't complain about anything and will definitely consider staying in condo 201 again. Maui is amazing, staying here made the vaction awesome. Out of the way, but close enough to everything. Napili Bay itself is incredible, and the Napili Bay property was the best and perfect compliment. Napili Bay Resort Condo 201 is breathtaking. From the well appointed kitchen, to the amazingly comfortable bed, and of course the patio that looks out into the most beautiful bay in Maui. We hired a masseuse for a massage on the patio-quite an experience! I'd highly recommend it. We toured the entire island and can unequivocally say that Napili Bay is the most beautiful bay on the entire island, and the condo is right on the beach! Thank you for sharing such a wonderful property with us! My stay in Unit 201 was my third stay at Napili Bay Condo's and I would have to say that although each of the units that I have stayed in were wonderful, Unit 201 was the best because of the upper level, corner location. This unit is beautifully furnished, equipped with everything you will need and nice patio furniture on the lanai to enjoy the breathtaking views. The only con with this unit would be if you had any physical issues that would make it difficult to get your luggage up the stairs. This complex is located on the best beach in Maui, the grounds are immaculate and the feel is relaxed. It is a short driving distance to lots of shopping and dining options, quite a few within walking distance.There may be some noise from the beach (because it is literally right below the lanai! ), but being on the second floor helps to buffer it. Do not hesitate to rent this unit. If you are headed to Maui for the beach, the scenery and relaxation, you will not be disappointed! This condo has incredible views, overlooks a stunning beach, and was well equipped and very clean. The sound of the surf at night was restful. It is a short walk down the beach to the Sea House Restaurant, one of my favorites. It is also a 10 minute drive to Lahaina and Kaanapali, where there is shopping galore. The snorkeling is superb in Napili Bay, and even better a short walk north at Kapalua Bay. The condo is small, but cozy and extremely romantic for 2. I highly recommend this condo, which has the best views in the development. If you're looking for a perfect swimming and snorkeling beach away from fast food restaurants and all the bustle of Kihei, then Napili Bay is where you want to be. Napili Bay condos are completely self-contained, safe, quiet and right on the best part of the bay. There's even a large tree on the beach for shade. A few great restaurants are within walking distance, if you feel you need a break from cooking. And spending time on the beach is a great way to meet your neighbours. Barbecues out back are super convenient, along with the laundry facilities and parking. I wouldn't stay anywhere else on Maui. It's the perfect oceanfront holiday. We spent 5 days in this beautiful condo overlooking Napili Bay. The sounds of the surf crashing on the shore as you sleep reminds you how close you are to the beautiful sandy beach at Napili Bay. We enjoyed being able to prepare our own food and eat it on the Lanai and watching the people on the beach. Napili Bay is one of the most relaxing and beautiful places on earth and I can't wait to come back again. I would choose this condo again because of the location on Napili Bay, the great accomodations and decor and because of the wonderful hospitality and personal touches that Jim will have waiting for you when you arrive. We made good use of our gift basket and we found the information that Jim left in the condo for places to eat, and what to see in the area very helpful for our stay. Thanks Jim. 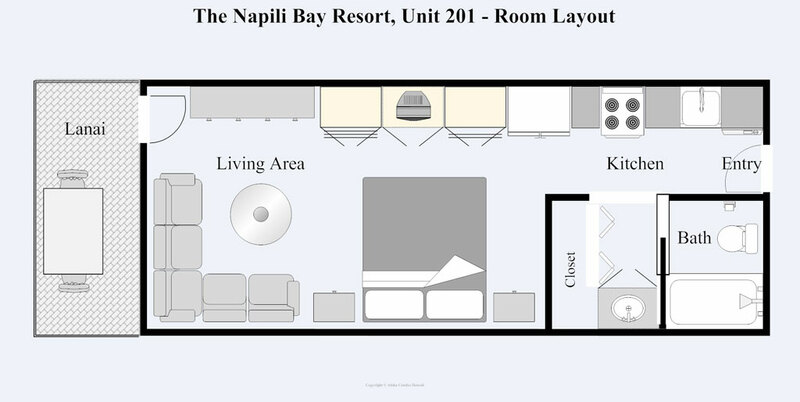 My wife and I have stayed in unit 201 ,Napili Bay on several occasions. It is an upstairs studio style condominium and is right on the beach. The facilities are all excellent, and being right on the beach, the views are superb. We enjoy the sound of waves crashing on the beach, and the excellent swimming so close at hand. Owner Jim Dornfeld is a pleasure to deal with. Jim also manages other units in the complex, and his systems are sensible and efficient. It goes without saying, that having stayed in 201 many times, we are delighted with it, and pleased to recommend it to others. My husband and I were truly delighted with our stay! It was the perfect relaxing place with a beautiful view of Napili Bay. The home was clean, comfortable and had everything we needed - including a small ice chest to take to the beach! Beach chairs, a bar-b-que pit, kitchen utensils, internet - all we provided were the snacks and swimsuits. You will enjoy your vacation time spent in this lovely home. How I fell in love with Napili Bay 201! I had waited 20 yrs. to visit Hawaii! I had explained to the travel agent that it would be my first trip to Hawaii with my husband and wanted something reasonably priced and on the water! They pointed me directly to "The Napili Bay" condo 101. I then read about it in Frommers. It turned out to be truly a dream come true for me when we stayed in this condo. My husband and I spent a week enjoying the view, the sun, the laid back atmosphere, the dinner on the deck watching the sunset! It was perfect! I would reccomend this condo to anyone. My girlfriend and I spent our 7th anniversary in #201 and it was everything we had hoped for and more! This was our first trip to Maui and we didn't want to stay in a busy hotel. We wanted somewhere on a swimming beach that was romantic but still have easy access to shopping and dinners out. The condo is perfectly located. It's on the best bay on Maui - beautiful sunsets, clear water for swimming & snorkelling, resident turtles, and only a few feet from breakfast every morning to the sand. An easy drive to Lahaina and the condo itself is well equipped, very clean, great decor and the sound of the ocean was wonderful to listen to every night. The welcome basket was a great touch! Evenings are very quiet and perfect for romantic moonlit walks along an empty beach. This is a unit that all you have to do is show up with your flip flops and your bathing suit and you're set. My wife and I had a trully memorable vacation last March 2008 (we wish were there right now). Room 201 at the Napili Bay was excellent. Perfect views, right on the beach (which was one of the nicest beaches overall we found on Maui. The room was perfect for the two of us. The room was stocked with conduiments which was unexpected and allowed us to enjoy some nice meals right on our lanei overlooking the beach and Napili Bay. The weather was perfect during our stay in March. The sound of the waves at night was wonderful. The Napili Bay, especially Room 201, is highly recommended. This was our first trip to Hawaii (hopefully not our last) and it was fantastic. Loved this place. Napili Bay is a very beautiful area of Maui. Less commercial and very relaxed. Napili Bay - 201 was the ideal place to stay for our Honeymoon. The condo is perfect. Very private and clean. We had everything we needed. The sunsets from the lanai are breathtaking. The owner, Jim, was very kind and responsive to our needs. We had planned to return for our first anniversary but went to Kauai instead. Too our regret...all we said the entire time in Kauai is "we should have returned to Napili Bay". Neeedless to say all future anniversaries will be at Napili Bay 201 for as long as Jim will have us!! The perfect spot, great views of the sunsets and so convenient. Everything was comfortable and very nice. Beautiful beach without the crowds...condo is in a lovely little corner spot with a kitchen, king bed, and cute little lanai (from which you can see Lanai and beautiful sunsets)...Perfect location for going to Lahaina or to other beaches nearby, and not so touristy as the high rises. Several restaurants just a walk down the sand, including at an exclusive resort nearby. We spent two weeks here.We've been to Maui several times but this is by far one of the best places to stay. Everything you need for a relaxing vacation is provided..beach chairs,towels & a cooler! The best beach in Maui is steps away with a wonderful cove to snorkel in. This unit is all about location, location, location! It's well appointed and with a full kitchen and community grilling area we found that most nights we would grill out, bring it back to our lanai and enjoy the best ocean front dining on the island! It was wonderful to sit back and enjoy the sunset with a cocktail without ever leaving "home". It's a great unit and being on the corner of the second floor the views are unbelievable. We definately recommend this unit..it has it all! We had the pleasure of spending 2 weeks here in May. Everything you need for a great vacation is provided...beach chairs and towels, a cooler and a fully equiped kitchen. The best beach in Maui is steps away with a wonderful cove to snorkel in. We spent almost every evening enjoying the sunset from our lanai. Between the full kitchen and the community grilling area, we had the best oceanfront dining each evening. The views from this corner second floor are unbelievable and the sounds of the palm trees outside are very soothing! We had a wonderful time and would recommend this unit highly. We stayed there after having visited Napili Bay in the past. We were impressed by the on line registration and videos that showed excactly what the room and views looked like from the apartment itself. The place was clean and the grounds were immaculate. We thoroughly enjoyed our stay and used the BBQ situated in the shady back area. We enjoyed the beach and also the availability of a fine restaurant (s) within walking distance and a convenience store for various items and the daily newspaper. We recommended it highlyto several friends. As I found and booked this property online I wondered how accurate the descriptions were until we arrived. It was very accurate and there was no surprises other than a nice welcome gift in the room. The property sitting on the beach allowed a number of activities for young and older participants. We watched whales drinking coffee in the morning on the lanai, playing on the beach, snorkeling in the wonderful bay accompanied by the resident turtles and catching as much sun as possible. We enjoyed cooking ourselves when we wanted in a well equipped kitchen although we have visited 2 restaurants easily accessible in neighboring resorts. There is a plaza close by to allow groceries shopping, renting snorkeling equipment, booking activities etc. We appreciated all information provided by the owners where to go, what to do, where to eat out. We did quite a lot of exploring of Maui but would likely be perfectly happy just to stay and rest on "our beach". We liked the unit perfect for 2 people- it was clean, well maintained - we were very comfortable after the first night that surprised us by the sound of ocean's waves and palm's "talking" in the wind. Overall it was one of the best vacation ever. I can wait to go back there. We liked the ocean being so close. The ocean sounds were very peaceful at night. It is quiet and relaxing and was very comfortable. It had everything we needed for a nice get away. The location on the beach can't be beat. The ocean and short beach right outside the door was so convenient. Checking the waves from the balcony made it easy to decide to swim or snorkel. The second floor was a plus because we left the windows and screen door open all night and felt the cool breezes. The room is small and cozy, but big enough for 2. The pub set on the balcony made for a great happy hour each sunset. Napili is one of our favorite beaches in Hawaii. I found and rented this property on line hence until we arrived I did worry how different the true experience will be. To my surprise it wasn't. The property's location so close to the ocean allowed morning whale watching sessions from unit's balcony drinking the first coffee, not worrying about putting the shoes on to get to the beach. The beach is great, and snorkeling in the bay easy. I loved the ability to cook in the unit although there are easily accessible 2 restaurants on both sides of the condo unit in the neighboring resorts. There is a number of stores close by to buy groceries, rent the snorkeling equipment, book activities. There was a number of suggestions what to do, where to go provided by the unit owners that was appreciated. The unit was clean, well maintained and equipped. We missed nothing and were comfortable after the first night of surprising sounds of the ocean's waves accompanied by the wind. Overall it was one of the best vacation experiences I had. We are planning to go back! What a wonderful spot to spend our 20th Anniversary. The view was breathtaking. The beach quite. The kitchen well stocked. The location far enough from Kanapli and Lahina to feel private, yet close enough so you can drop in for lunch, dinner or shopping when you feel the need. I read about Napili Bay in a newspaper article about inexpensive winter getaways. Not only was it inexpensive, but the condo is quiet, well-equipped and perfectly located for a relaxing and scenic retreat. It is close to restaurants, shopping and any kind of recreation that you would want to experience. It was the first time that my husband had been to Maui, and we had such a wonderful time, that we revisited a year later. Though on our revisit we did not stay at Napili Bay, we wished that we had. We stayed here on our honeymoon and had a wonderful experience. The condo is fairly small but very functional and clean. Falling asleep to the sound of the waves 20 feet away was awesome.